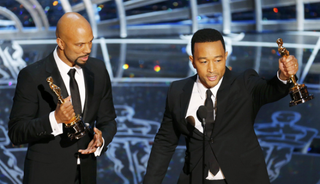 Common and John Legend accept the best original song Oscar for “Glory” from the film Selma Feb. 22, 2015, in Hollywood, Calif. Despite being nominated in only two categories, Selma stole the Oscars Sunday night by virtue of a best original song victory that was preceded by an electrifying performance of the song, “Glory,” by John Legend and Common. The musical performance added heart and soul to what was an otherwise pedestrian Academy Awards telecast. Accompanied by dozens of backup singers doubling as marchers and a set re-creating Selma, Ala.’s Edmund Pettus Bridge, along with portraits of both the real-life civil-rights-era demonstrations and their cinematic counterparts, Legend and Common shut down the Academy Awards. The audience of Hollywood heavyweights, including Oprah Winfrey and an emotional David Oyelowo—the actor who played Martin Luther King Jr. in Selma—was in tears. But the triumph wasn’t over. A few minutes later, Legend and Common bounded up the steps to the stage, after being awarded the Oscar for best original song, where both artists eloquently dedicated their victory to America’s ongoing struggle for civil rights and racial justice. Legend kicked things off by recalling their recent performance at the Edmund Pettus Bridge to commemorate the 50th anniversary of Bloody Sunday demonstrations that culminated in the passage of the Voting Rights Act. Legend’s speech amplified Common’s broader themes of social justice by connecting the fiercely political vision of Nina Simone to contemporary issues of equality. “We wrote this song for an event that was 50 years ago, but we say that Selma is now because the struggle for justice is right now,” explained Legend, adding that voting rights are now “being compromised” and reminding Oscar viewers that the United States has the world’s largest prison population. “There are more black men under correctional control today than under slavery in 1850,” said Legend, closing two speeches that, in less than two minutes, encompassed the panorama of the African-American freedom struggle. Without ever using the phrase “Black lives matter,” Legend and Common turned Hollywood’s Dolby Theater into a sacred place of the kind of morally relevant witness that used to regularly be a hallmark of black artistic engagement. Standing on the shoulders of Simone, Harry Belafonte and others, Legend and Common transformed the snubbing of Selma into one of the most powerful moments in the history of the Academy Awards. Ava DuVernay, the brilliant director who made this all possible, sat in the audience beaming, her creative genius blooming in front of a global audience, despite being shut out of the best director nomination. And the song “Glory”—a fusion of old-school gospel, soul, hip-hop and R&B—is an appropriate testament to Selma’s complex and masterful artistic fusion of a history that continues to resonate in our own time. Both the song and the movie speak unspoken truths about race, democracy and civil rights in the past and the present. Selma is more than a movie about civil rights marches led by King a half-century ago. Selma is about a struggle whose challenges and complexities grow with each successive generation, even as they remind us of the beauty in struggle and sacrifice. Selma is, as Legend said, now.